I spent a morning at the Gatorland rookery the weekend before last. My friend Debbie Tubridy was in town, and we decided to check out the rookery, expecting it to be teeming with birds. But it wasn’t! The morning-light side of the rookery didn’t have nearly as much activity as in previous years. I was very surprised as I walked out onto the boardwalk and saw open expanses of Brazilian Pepper without any birds. 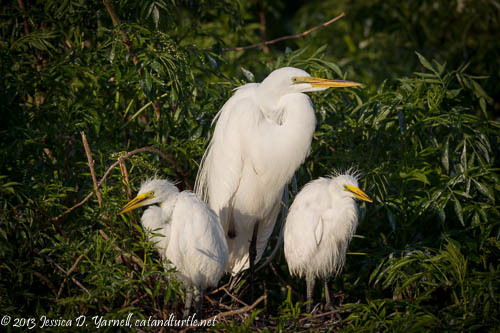 The Great Egrets are nesting, but we saw very few Tricolored Herons or Snowy Egrets. It was disappointing. I wonder if the weather is a factor, if the birds aren’t nesting as early because we keep getting cold snaps. It didn’t seem to bother the Great Egrets, but maybe the Snowies and Tricoloreds have more sense than to nest when it’s still dipping into the high 30s? Maybe? Babies on the Way! Gatorland Rookery. 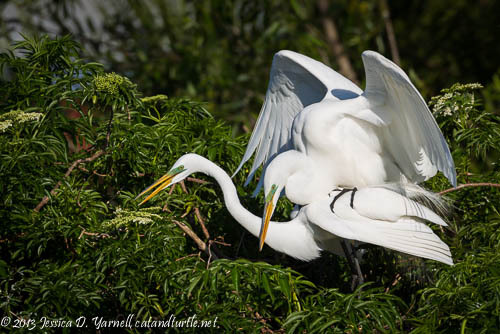 Debbie and I had fun listening to the funny calls of the few Snowy Egrets. I tried to get shots of these pretty birds in their breeding colors, but they were not very cooperative. They make their nests deep in the vegetation, and the silly birds were more interested in nest-building and courtship than in posing for my camera. 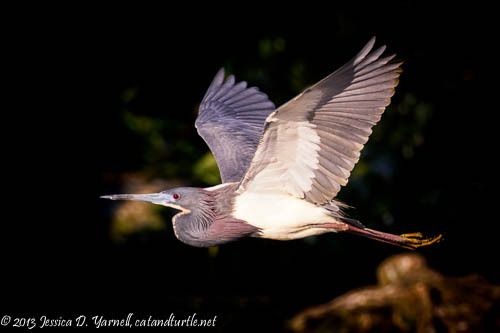 So my consolation prize was a good flight shot of a Tricolored Heron in good breeding colors. I love how their eyes turn bright red during peak breeding season. 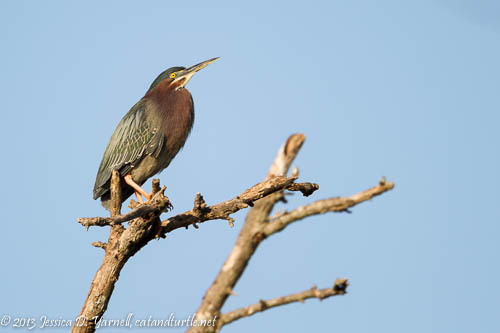 We were surprised to see a Green Heron perched in one of the treetops. Later he was joined by a second heron. We continued watching the pair as they flew in and out of what we concluded to be their nest site. In previous years they have not nested in the rookery, so it’s fun to think they have moved. (I think their previous nesting habitat is gone. I didn’t see their little island in the pond anymore.) Debbie and I tried to get flight shots as they passed in front of us, but they were so fast that we didn’t see them until they had passed us. We encouraged them to do several circles around us before moving on, but they didn’t listen to us. Then they took the back door into their nesting area! I was very excited when I looked up and saw a Swallow-Tailed Kite flying overhead. My first of spring! This one was being chased by a grackle. When I looked at my pictures, I thought I saw why – the kite had a lizard, and I bet the grackle wanted to steal it. What a great way to end a morning at the rookery! The Big Chase. 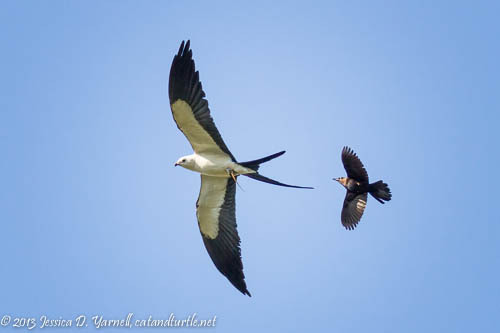 My first of spring Swallow-tailed Kite with a grackle in close pursuit. Gatorland Rookery. Beautiful shots! I think it’s early even though nesting season is early this year overall. Last year I went in mid-March and was the same as this year. Then I went back in early May and the bushes were packed with snowys, little blues and tri-colored babies. I think things there crank up later. But, I did notice they trimmed the bushes back a lot this year. I’m going to try and go back around the first weekend in May. I hope you’re right and the activity picks up! Herman’s rookery was really slow this year also. Herman was surprised. Let me know when you plan to head this way! What a fun day we had and despite having less birds, you sure got plenty of keepers! We totally had a fun day or two.